I am a confirmed lover of condiments, sauces, salsas and dressings my fridge is dominated by jars of tasty concoctions to make the ordinary extraordinary. 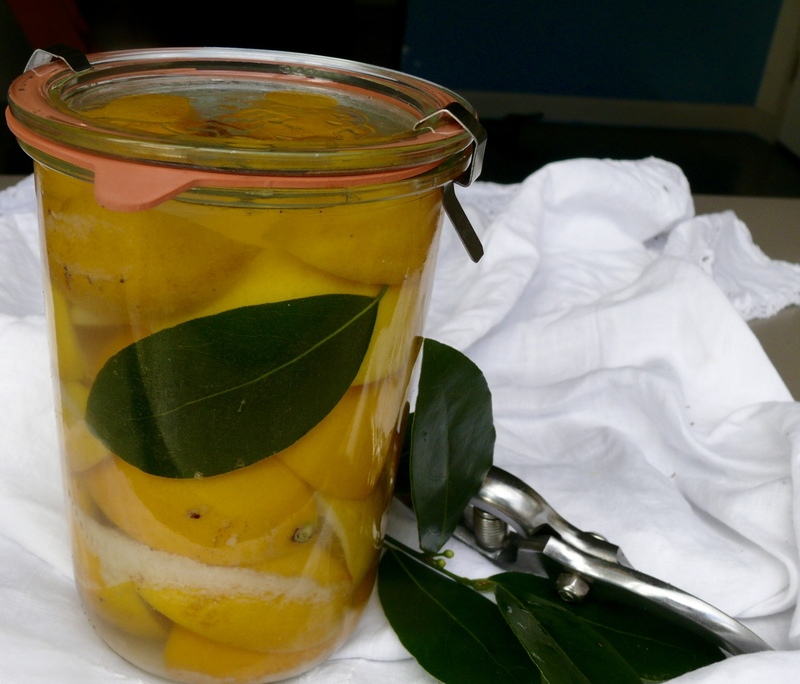 Preserved lemons are among my favourites and although not something I use every day, when I am cooking fish, braised meats and vegetables or salads with a mediterranean twist these are part of my go to flavour options. 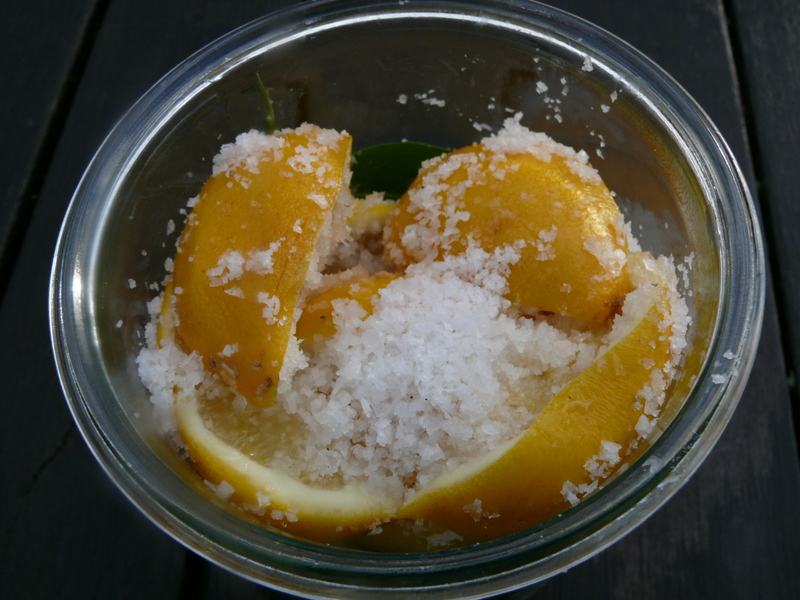 New Zealand citrus fruits are at there peak over the winter months so its a great time to make use of them and preserve some for the rest of the year. You could also get an early start and make a few jars now to give away as christmas gifts or hostess gifts. They take minutes to make and need at least a month (minimum) and up to three months to cure. Once cured they can remain in a coolish dark cupboard and are stable for at least a year. Once opened keep them in the fridge. In the fridge they seem to keep indefinitely and I have had them at times for up to a year with no apparent loss of quality, as long as they remain covered in the brine. Over the years I have decreased the amount of salt I use and have not noticed any deterioration in quality and found I am able to use more without over salting my food. You can make as many or few jars as you like, as I say they do make great gifts, you could add a recipe for using them at the same time, (I would love to think I would do this in my perfect dream world). 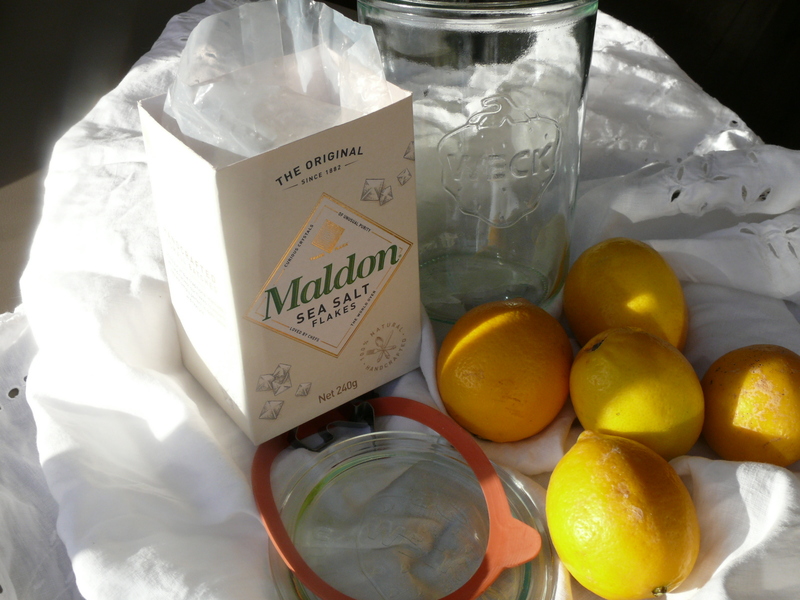 The amounts are all about the number of lemons you have and choosing a jar or jars to fit them. First it is important to make sure your jar is clean and sterilised. You can do this in the dishwasher, or, in the oven set at 120c for 10-15 minutes, or in a pot of boiling water for ten minutes. I like to scrub the lemons in hot water to make sure they are clean, and to remove any possible wax. 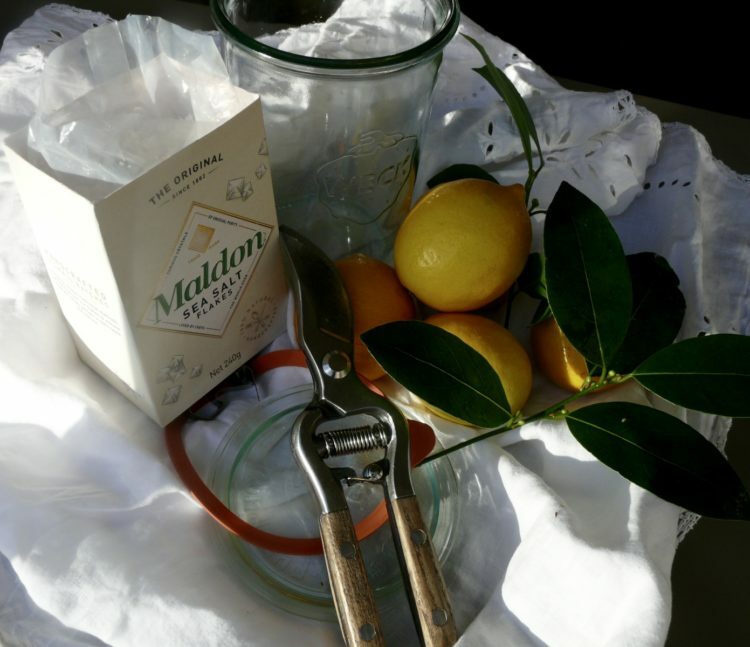 Then it is a simple matter of slicing the lemons in quarters and layering them firmly into the jar with the salt and bay leaves and or chillies if using. As you layer the lemons sprinkle 1 tablespoon of salt between each layer. Think about how it looks as you go, these make great gifts so it is important for them to look attractive. Fill the jar to overflow with cold water, firmly close the lid, and wipe up the spillage. Gently give the jar a few turns and a shake, if all the salt dissolves you need to add another tablespoon of salt and repeat until you can see a little salt in the jar. It is now ready to store in a cool dark place, if you remember over the next few months give it a turn and a gentle shake to mix the brine, and admire your handiwork. It will be just ready after one month – if you cant resist testing it out – and perfect from three months on. Traditionally the lemon is cut through the centre leaving the end in tact so it holds together. 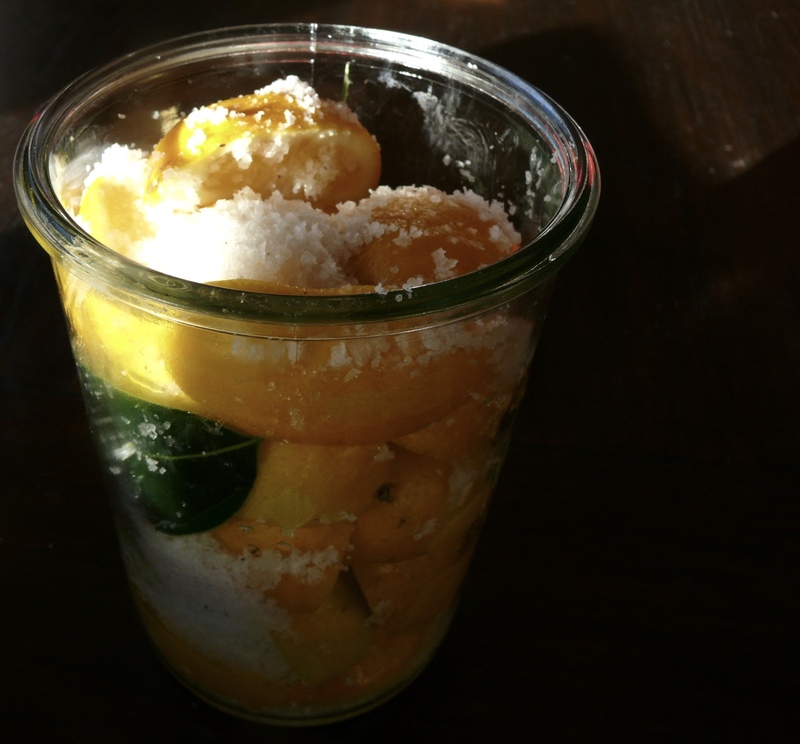 I find you cant get as much lemon in the jar this way so prefer to leave it whole. You can decide for yourself what you prefer. Make a jar or two and let me know what you do with them.